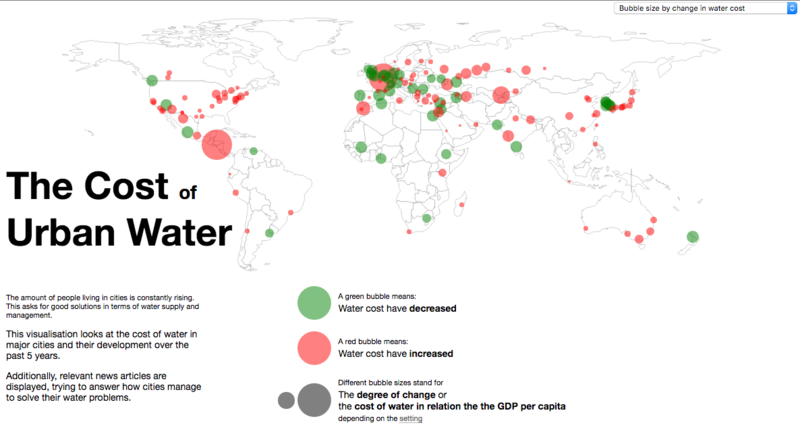 A visualisation for the 2010 World Water Day based on datasets on water cost by the UN and articles from Google News. This visualisation looks at the cost of water in major cities and their development over the past 3 years. Cities are divided in two groups: The ones that managed to lower the cost of water (green) and the ones where water cost have increased (red). Cities are sorted based on the degree of in- or decrease. Municipalities that managed to lower their water cost can easily be spotted, as well as places where cost have increased above average. The second option allows for sorting based on the cost of water in relation to the country's GDP per capita. Regions with relatively expensive water stand out from the map. Upon selection of a city, detailed information on water cost and city development are shown. Additionally, the visualisation tries to look for relevant news articles on the subject of water management and water supply for the respective city. This should encourage the viewer to look behind pure facts of data and research the reasons and events that lead to them.